Co-management involves sharing your care between closely co-operating health practitioners. Some systemic and ocular diseases and/or the medications used to treat these conditions may require you to be under the ongoing care of a medical specialist such as an ophthalmologist, rheumatologist or endocrinologist, as well as your general medical practitioner. For example, in the case of co-management with rheumatologists and dermatologists, routine eye examinations and scans are often necessary to ensure there are no ocular side effects of your medications. Co-management with an endocrinologist is critical for the early detection of diabetic changes to the eye. The most common co-management arrangements are those between us and ophthalmologists. In these circumstances we perform some of the ongoing work of regularly monitoring your condition and report back to your ophthalmologist. This is an area we have considerable experience in. There are a number of benefits to co-management. From your point of view, we are often more accessible and it is frequently easier to make an appointment with us than your specialist. Your costs are also reduced. Co-management also frees up the ophthalmologist's time so that they can be involved in procedures that fully utilise their skills. 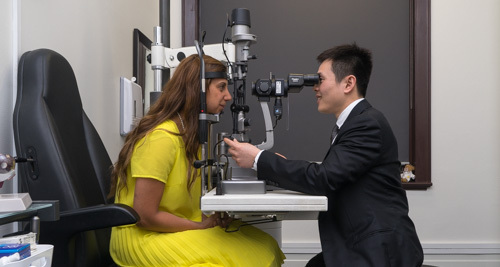 Examples of conditions that we are frequently involved in co-managing with ophthalmologists and other health professionals include glaucoma, diabetic retinopathy, pre- and post-cataract or laser refractive surgery, and monitoring for side-effects of medications such as plaquenil.